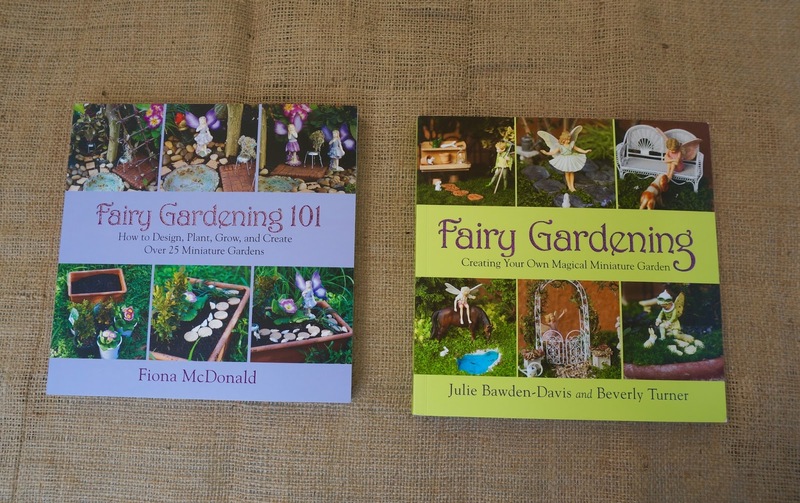 As promised here are a few tips on how I create my fairy or mini gardens both at home and at school. 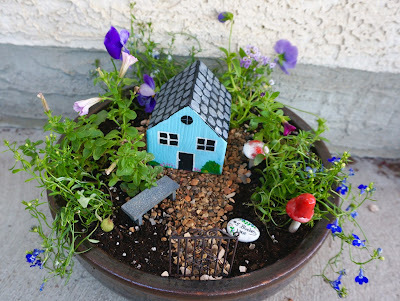 Here is latest mini garden I created with my son for a teacher gift in June. Here are some mini gardens I did with Grade 4 in May. There are a few differences mostly due to the cost of supplies. The nice thing about these gardens are you can replant them. So students can relocate them to a larger area when they take them home. The houses are also reusable so you can make a new mini garden every year. That's what we do at our house. - pot of some sort, at school we used 12" plastic pots (around $1.00 a piece). For gifts or for your own use you can purchase a larger one. 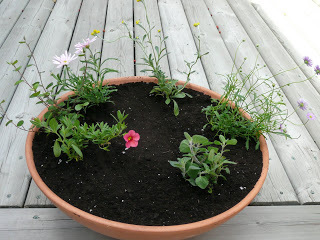 I like to use a ceramic pot that is shallow with room for the garden to grow. The house is what makes the garden. 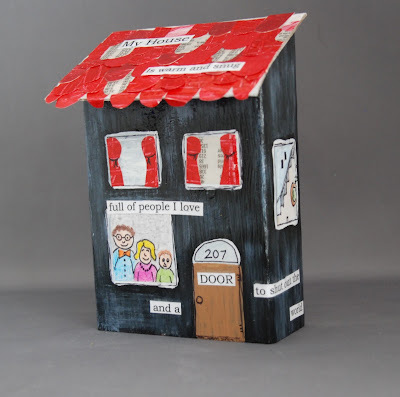 I have used unpainted ceramic houses that you purchase at Christmas time and then paint. I turn the snow into moss and the wreath on the door into a summer wreath. You can check out this post for more info on that. Buying multiple class sets of ceramic houses doesn't work so well at school. First off they are breakable. They are also full of detail requiring a lot of time and patience. Not too mention the cost. Just a little too expensive for a class project. A few years ago I moved to these wooden houses. This one is a little tall, (a 2 storey house) at school they are shorter about 4" tall. They tend to come in 8' lengths. I can get a full class set out of 1 timber. Cost wise it is about $23 or so. 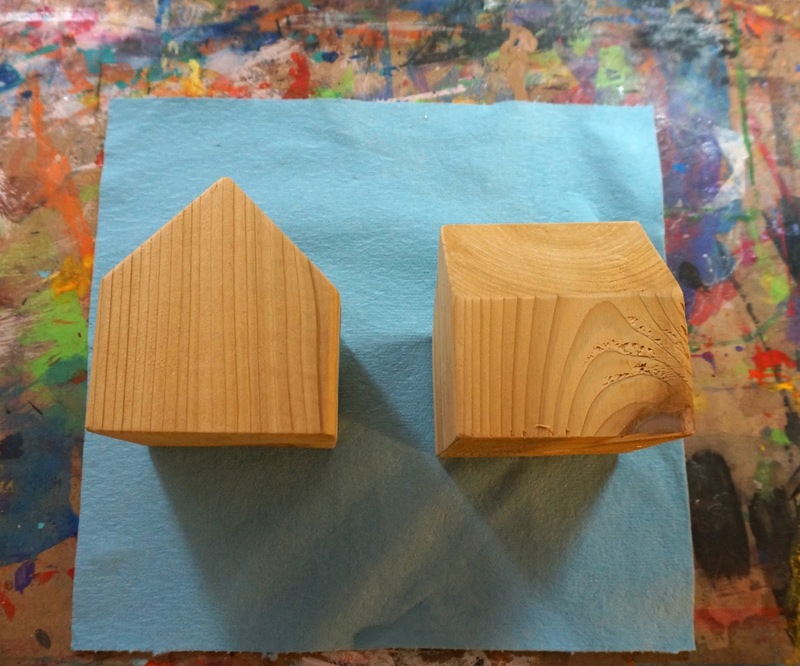 Cut your 4" blocks and then cut the ends off to form the roof. I have a great carpenter (my father-in-law). Another alternative is to use this kind of house. This is a poetry project I use but the house is made from a 2"x4". You alternate an angled cut with a straight cut and you get 2 houses. The roof on this one is cardboard but you can use a piece of cedar shingle. You can paint them separately and then nail the roof in place. These are much cheaper as a 2"x4" in an 8ft length costs about $3.00. At school this is a 2 session project. 1 to paint the house and 1 to plant the garden. 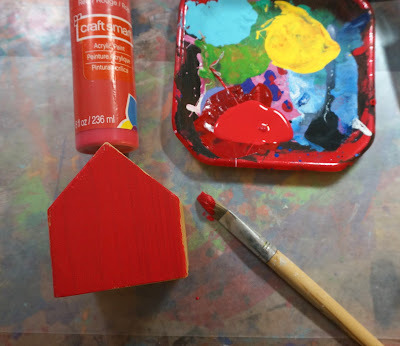 With the cedar timber house I get students to paint the house colour first. and add the shingles. A nice grey colour makes a good shingle. Hopefully the house is now dry. It's time for the windows. The secret to good windows is small brushes. 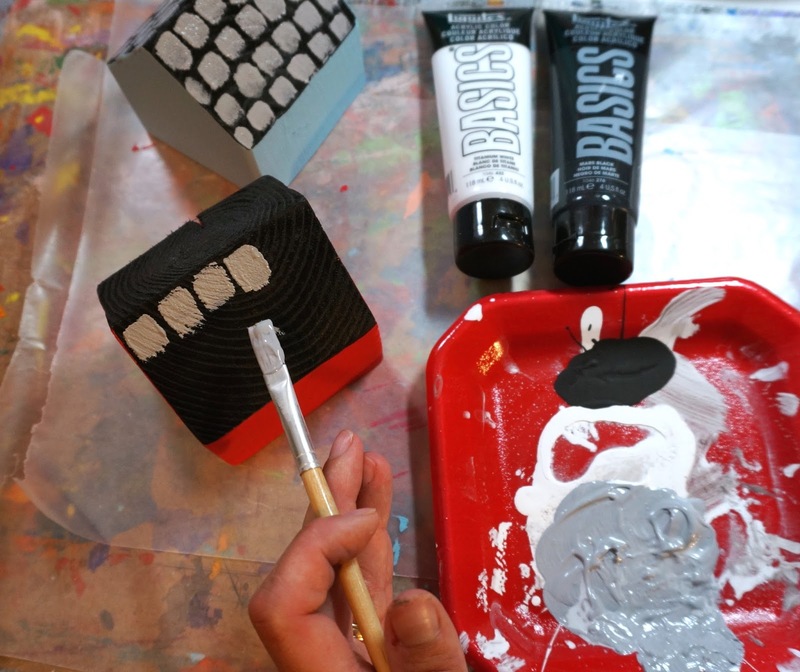 A small flat brush is easiest. 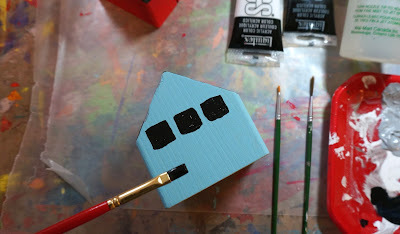 You use the straight edge of the brush to paint the straight edges of the window. 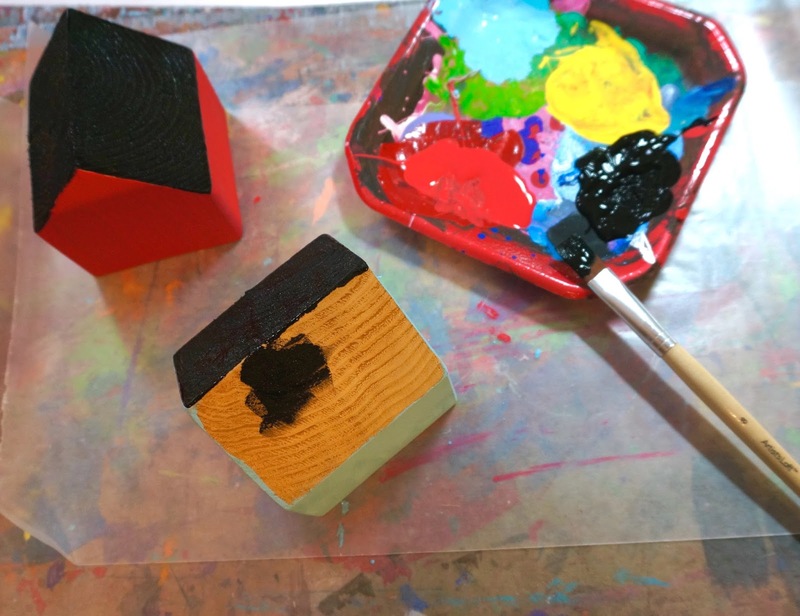 You may need to dry a side with a hair dryer before you can work on the next one. An art teacher always needs more hair dryers and electrical outlets!! Add a door, use the end of your paintbrush to dab on the doorknob. You can add window panes. 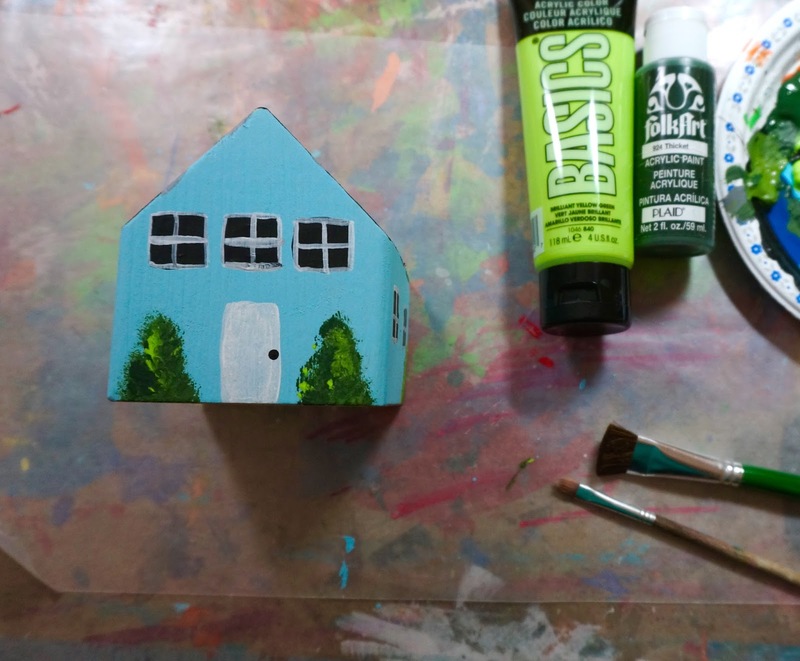 To steady your hand make sure it rests on the house as you are painting those panes. 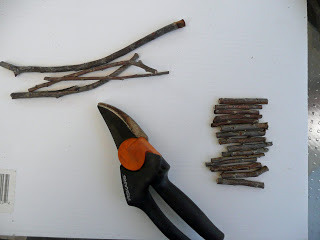 You can add some shrubs with a sponge or scrubby brush (old brush). When dry add a coat of outdoor sealer. A nice address sign adds a special touch. 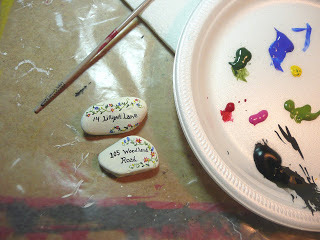 Paint a flat rock white. When dry you can use sharpie or paint (you need a tiny brush) to add the numbers. Give it a coat of outside sealer as well. Now it's time to plant. 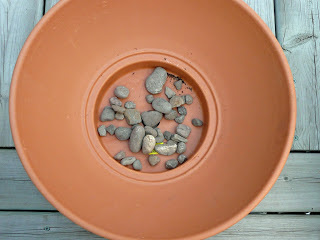 Add some rocks to the bottom of your pot. Plant your plants leaving a spot for your house. At school kids were only able to use 3 plants due to space. You can add some moss to fill in the spaces if you wish. Another nice touch is a fence made from cut twigs. You can add gravel for a path. Place your house and sign rock and you are done. Students didn't have a lot of room but quite a few still made a path with pebbles. You can make this an indoor garden with small house plants. I plan on doing this so I can make that Fall garden (it's Canada and we are frosty in the Fall) and then switch it out to a Winter/Christmas scene. Marcie Woods and Sangeeta Duorah. I have another book giveaway next week and a great new project.